CVMA membership is comprised of Full Members (those with verified combat service) and Supporter Members (those who have non-combat military service and have a sincere dedication to helping veterans). CVMA has members from all 50 states and living abroad. Many members continue to serve in our Armed Forces, with several serving in combat areas now. CVMA sponsors and/or participates in many motorcycle-related charity events each year and, as a non-profit organization, donates to various veteran care facilities and veteran charities. 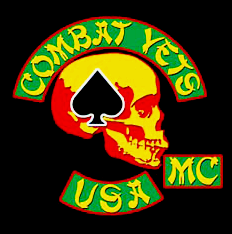 In 1999, the Combat Vets Motorcycle Club was introduced to the internet. Initially it was believed that the CVMC was an actual established motorcycle organization but, in early 2001, it was discovered that CVMC was simply an internet scam designed to milk money from combat veterans. forty-five members decided to form a Combat Veterans Association. In May of 2001 the Combat Veterans Motorcycle Association was started as a non-profit organization, allowing its members to continue working toward their main objective of helping veterans. The original 45 members have adopted a patch to wear indicating that they are the original founding members of CVMA. 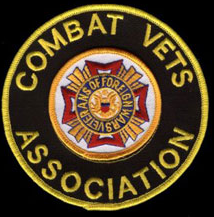 In May of 2001, the CVMA adopted the CVMA / VFW patch. This was done with the VFW's permission as all CVMA members were or became VFW members, entitling them to wear the VFW patch. Over the next year and a half the CVMA was well accepted at Post and Division levels within the VFW, but repeated meetings, letters, and conversations with the VFW National failed to define an officially recognized relationship between CVMA and VFW. In December of 2002, the CVMA membership voted to begin moving towards officially establishing the type of association its members wanted to be, independent of the VFW or any other organization. As part of this decision, VFW membership was no longer required, opening the CVMA up to all Combat Veterans who ride a motorcycle. On December 15, 2002, it was voted that the CVMA would wear a combination of the CVMA / VFW background and the old CVMC skull logo as a one piece patch. Membership requirements being that a new member had to be a combat veteran and had to ride a motorcycle as a hobby. This patch is worn by Full Combat Members only. By January of 2013, CVMA Chapter 28-2 in Huntsville, Alabama, had enough members living in the northwestern part of the state that they were authorized to form their own detachment, Detachment 28-2-1 in Hamilton. By August of 2013, Detachment 28-2-1 had enough members to apply for recognition as their own chapter and in October of that year Chapter 28-4 was officially recognized by the CVMA National Board of Directors. We are based out of Marion County but we serves in all surrounding counties our monthly meetings are held at the Elks lodge in Hamilton. Held on the third Saturday of the month starting at 1000.